Samsung's back at it again with an update to their insanely popular Galaxy Tab range! 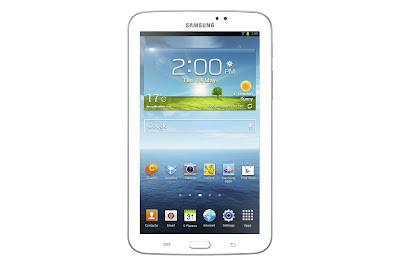 This time the South Koreans have announced the Samsung Galaxy Tab 3! This time again the Tab is a budget device, so there's modest specs this time and lets have a look at them! This time you'll have a solid 7 inch WSVGA screen, that's 1024 x 600p which gives you a PPI of 169, and it's a TFT LCD panel, which isn't the best in this day and age, but it should get the job done in this sort of device. What you'll be using on that screen is Android 4.1 Jelly Bean which as you would expect will have the Touchwiz overlay, but things should be relatively snappy on the unspecified dual-core processor which is clocked at 1.2Ghz and is backed up by 8 or 16GB of internal storage which can be expanded by SD cards up to 64GB and there's a solid 1GB of RAM on board too. Your money also gets you a couple of cameras; the rear one is a 3MP sensor and round front there's a 1.2 mega-pixel shooter which will definitely be good enough for video chatting. The only things which concern us here are the older version of Jelly Bean because we're not sure how forthcoming updates will be, perhaps there will be one at some point in the future, but we do expect this to be a cheap tablet and that should help us gage where our expectations should be. If you're interested in the device then you can pick it up in either a Wifi-only configuration, or you can get one with 3G connectivity, that latter is 4 grams heavier than the former at 306g. Unfortunately there's no word on pricing or availability, but we'll be sure to let you know if we hear anything! Perhaps the Asus FonePad will be a good competitor to this if this device comes in at anything more than £200! The full press release is available here!